The Parish Magazine serving Charvil, Sonning and Sonning Eye, is believed to the be oldest, continually published church parish magazine in the country. The first issue was published in January 1869. Below are issues from April 2005 until the present day. Archive issues dating back to 1869 can also be viewed online – please contact editor@theparishmagazine.co.uk for more information about how to view these files. The magazine has won national awards for its design, content, and editing and print quality. Regular features include the vicar’s letter, parish notices, news from around the villages, a children’s page, and general interest articles including the arts, health, home and garden. 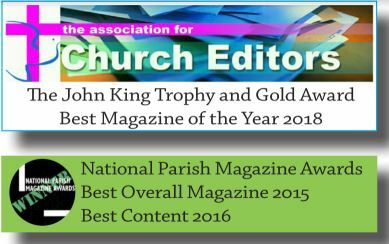 When advertisers in The Parish Magazine have websites these can be accessed from the more recent issues by clicking on the advert. Email and website addresses within the articles can also be reached by clicking on them when on online.